This week's Deal of the Week is the MetroPCS iPhone SE 32 GB which is free at MetroPCS stores when you port your number to Metro PCS and activate on the $50 or higher plan. The iPhone SE has a 1136x640 px 4 inch screen, 12 MP rear and 1.2 MP front cameras, Apple Pay support, fingerprint sensor, 64 bit A9 SOC and 2 GB of RAM. If you aren't a fan of the diminutive SE, MetroPCS is discounting all iPhones by $150 when you port a number and activate it on a $50 or higher plan. There are some restrictions on which phone numbers you can port and qualify for a free SE or $150 off a higher priced iPhone. For example, the iPhone 6s 32 GB is $149 when you port-in. To qualify, the number must be a wireless number that isn't currently active on the T-Mobile network and hasn't been active on MetroPCS in past 90 days. Samsung Galaxy S8 $349.99 (reg $699.99) online only when you port a number to Cricket. Currently sold out. Ends 3/29. Samsung Galaxy Amp 2, Alcatel Verso Free, LG Fortune Free, ZTE Overture 3 Free, CPO ZTE Sonata 3 99¢, CPO Alcatel Streak 99¢, CPO Alcatel Pixi Theatre 99¢, CPO Samsung Galaxy Sol 99¢, CPO HTC Desire 520 99¢, CPO HTC Desire 625 99¢, CPO LG Spree 99¢, Alcatel PulseMix $9.99, LG Harmony $19.99, Alcatel Idol 4 with VR Goggles $39.99,, Alcatel Idol 5 $129.99 when you port your number to Cricket. Updated 3/14/18: Price cuts and new items since Sunday in bold. Here in NYC, independent dealers force you on the $60 plan for any promo. They also charge a $25 fee for activation and set-up, taxes that adds up to $20 no matter which device you purchase, and force you to buy a case and screen protector. They will literally let you walk out the store if you dont buy the accessories. Independent dealers own prepaid in NYC, it actually irks me that promos aren't available online, as well as in-store. Do you have to continue service past that initial month or can I just set it aside for 90 days and wait for it to unlock without active service? The phone has to be active for 90 days of service, to save costs customers start service with the $50 when found instead of the $60 forced plan, then after one month switch down to the $30 plan for the next 2 months and then the Iphone unlocks on its own and then it is useable for other MVNOs. Your right. MetroPCS retailers are awful. They always come up with bogus fees. actually metro has revised the promotion. no more plan requirement all plans qualify and also if you port 1 number you can get up to 4 Iphone SE for free. you can port 1 number, sign up for 4 lines for 100 and get 4 iPhone SE for $100 total. absolutely incredible deal. i don't believe this offer is being advertised to the public but should be available at all dealers across the country. if independent dealers are charging activation fees or forcing certain plans it is not OK with metroPCS that they do that and they risk being shut down if caught. i know i own several metroPCS stores. But if you (the independent dealer) aren't charging activation fees & forcing certain plans, how are you making money? How do independent dealers earn money anyhow? Seems many have already been discouraged by the Metro deal. I was going to try to get it, but I do not want to endure the pain of going to a Metro store. I've never had a good result trying to get a promo deal at an independent Metro store. Coperate stores have been mixed results but better than batting 0 at independents. If you have a corporate store near enough to you it may be worth a visit. I did the MetroPCS iPhone SE deal on March 1st. Having heard about issues with non-corporate stores, I called the Lansing MI corporate location first. They only had one SE available, in Rose Gold. Didn't think they would be getting more. Then I called the Flint corporate store and they had space grey which was what I wanted. The next morning I setup PagePlus service on an old Palm Pixi+. Thirty minutes later I went to the corporate store. Maybe 30 minutes of ordering/porting, then they said it would take about an hour to finish (waiting for the port to go thru, I guess). So I went to the Post Office, when I went back to MetroPCS I was in & out within a minute. I did pay $9 extra in services, which I thought was taxes or "MI 911 prepaid fees", but looking at my account now was call detail ($1), NameID ($2) and handset protection ($6). I don't mind too much, considering the overall deal. Oh, all the people I worked with at MetroPCS and PagePlus seemed very competent. This month is the 2 year anniversary of the iPhone SE, which has the guts of the 2.5 year old iPhone 6s. I wonder if they are being cleared out in advance of a replacement model this month or maybe during the June WWDC? Only Apple knows. And the model they are promoting is the model that was updated after ~a year, not the original. One rumor says the SE2 or X SE will cost up to $799. A mini X with no bezels. With the rapid deployment of 600, it might be helpful to start a "Deal of the Week" subsection for band 71 capable devices when more of these start becoming available. Good comment. I likes dat idea! 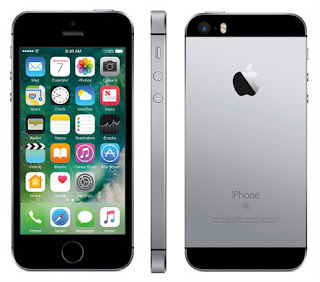 Bidallies via eBay offers the refurbished Unlocked Apple iPhone 6s 16GB GSM Smartphone in several colors for $169.95 with free shipping. Unless they left out some parts, this phone should work on all 4 major US networks. refurbished = essentally used in good condition . Who know how long the battery has left. It doesn't matter at this price. Get in line for a $29 battery replacement at your local Apple Store is the battery measures less than 90% original capacity. It's worth the money. Check again in August, a couple of months before the program ends. Dennis,another great ST phone deal- 30$ for these specs. Are these GSM unlocked as they are on Verizon network? All TracFone brands' phones are locked. Also the specs say it's a CDMA/LTE device, so no GSM. Dennis, For this Metropcs deal, is the iphone se locked to metropcs / t-mobile? Can a sim from freedompop work? How much would it cost to unlock it? MetroPCS phones are locked to MetroPCS. Metro will unlock the phone for free after 3 months paid service. I don't if 3rd party unlockers can unlock the Metro SE or not or how nuch they charge. Search eBay for unlock availability and pricing. If you're thinking about buying a new cellphone this year, start your research. Possible new tariffs of up to 60% on consumer electronics from China could cost you money. AFAIK, only Apple honors the warranty for the second owner. Other resales have no factory warranty, unless it's purchased by the seller or buyer. If the eBay seller is an authorized dealer selling phones to the first owner, you're OK. Otherwise you only have 30 days warranty via eBay unless you buy a warranty. If an eBay seller advertises a 1-year warranty, send an eBay message asking them to confirm that they are authorized reseller and the phone is being sold to its first owner.